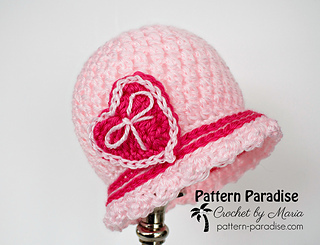 This hat is sweet with a pretty heart patch that is perfect for Valentine’s Day, but it doesn’t stop there. The hat is so versatile you can customize it in many different ways for different looks. 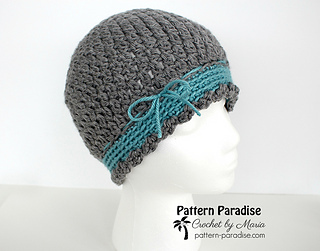 The stitching is a simple twist on a double crochet and creates a pretty fabric with interest. I love the band with its raised ribbon rows. A little surface crochet makes these rows pop! The pattern includes all sizes from 3 months to adult and the heart patch. > See the coordinating Sweetheart Leg Warmers HERE.